We just published a Temkin Group report, What Happens After a Good or Bad Experience, 2017. This is our annual analysis of which companies deliver the most and least bad experiences, how consumers respond after those experience (in terms of sharing those experiences and changing their purchase behaviors), and the effect of service recovery (see last year’s report). About 19% of the customers who interacted with Internet service providers and TV service providers reported having a bad experience – a considerably higher percentage than in other industries. Of the companies we evaluated, 21st Century, Spirit Airlines, and HSBC deliver bad experiences most frequently. We looked at the percentage of customers in an industry had a bad experience and combined that number with the percentage of customers who said they decreased their spending after a bad experience and then used this data to create a Sales at Risk Index for all 20 industries. Rental car agencies stand to lose the most revenue (6.7%) from delivering bad experiences, while retailers stand to lose the least (1%). Investment firms are most effective at recovering after a bad experience, whereas TV service providers are the least effective. After customers have a very bad or very good experience with a company, they are more likely to give feedback directly to the company than they are to post about it on Facebook, Twitter, or third party rating sites. Customers are also more likely to share positive feedback through online surveys and share negative feedback through emails. Compared to previous years, customers are more likely to share feedback over Facebook and Twitter, and these channels are most popular with consumers who are between 25- and 44-years-old. Of all the companies we evaluated, The Hartford is the most likely to receive negatively biased feedback directly from its customers, while Chubb is likely to receive the most positively biased feedback. We just published a Temkin Group data snapshot, Media Use Benchmark, 2017. This is our annual analysis of how much time consumers spend using different media channels (see last year’s data snapshot). In January 2017, we surveyed 10,000 U.S. consumers about their media usage patterns and compared the results to similar data we collected in January 2016, January 2015, January 2014, January 2013, and January 2012. Our analysis examines the amount of time consumers spend every day watching television, browsing the Internet (for both work and leisure), reading books (both print and electronic), reading newspapers (both print and electronic), listening to the radio, reading a print magazine, and using a mobile phone. This data snapshot breaks down the results by income level, education level, and, most expansively, by age. Time spent over the last six years with mobile web/apps has increased the most, followed by using the Internet at work and reading a book online. Across all of the media activities we track except for using the Internet at work, consumers spent more time doing them in 2017 than in 2016. Consumers increased their time reading paper books and magazines by 30% over last year, the largest increase of any activities. While consumers increased their reading of newspapers, they also had a jump of 27% in the amount of time they spent reading the news online. We just published a Temkin Group report, Lessons in CX Excellence, 2017. The report provides insights from eight finalists in the Temkin Group’s 2016 CX Excellence Awards. The report, which has 62 pages of content, includes an appendix with the finalists’ nomination forms. This report has rich insights about both B2B and B2C customer experience. This year, we named five organizations the winners of Temkin Group’s 2016 Customer Experience Excellence Award – Business Development Bank of Canada (BDC), Century Support Services, Crowe Horwath, Oxford Properties, and VCA. This report highlights specific examples of how these companies’ customer experience (CX) efforts have created value for both their customers and for their businesses, describes winners’ best practices across the four customer experience competencies: purposeful leadership, compelling brand values, employee engagement, and customer connectedness. it includes all of the winners’ detailed nomination forms to help you collect examples and ideas to apply to your own CX efforts. Voice of the Customer (VoC) programs are a central part of most customer experience efforts. 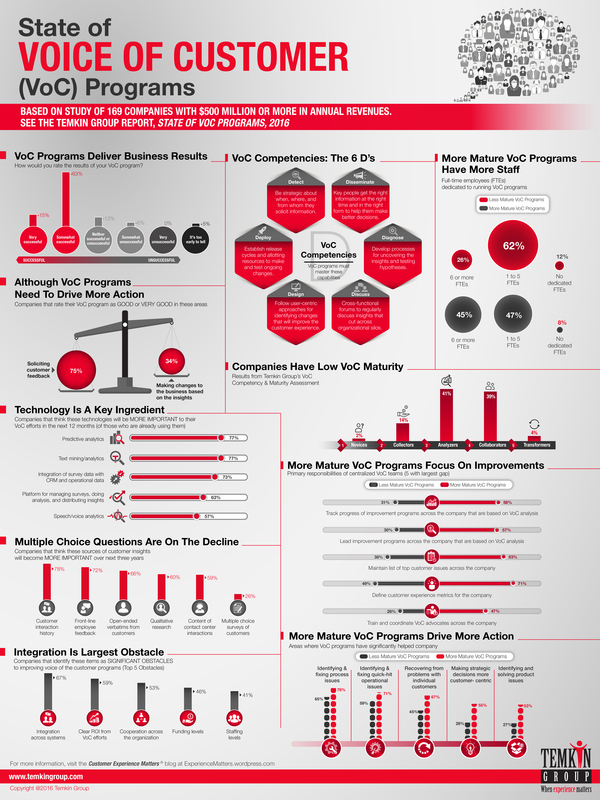 Here’s some interesting data snippets from the recent report, State of VoC Programs, 2016. For additional info, check out our VoC resource page. Temkin Group surveyed 183 companies to learn about how they use customer experience (CX) metrics and then compared their answers with similar studies we’ve conducted every year since 2011. We found that the most commonly used metrics continue to be likelihood-to-recommend and satisfaction, while the most successful metric is transactional interaction satisfaction. Only 10% of companies regularly consider the effect of CX metrics when they make day-to-day decisions. The top two problems companies face are limited visibility of CX metrics and the lack of taking action on metrics. Companies are best at measuring customer service and phone-based experiences and are worst at measuring the experiences of prospects and customers who defect. We also had companies complete Temkin Group’s CX Metrics Program Assessment, which examines four characteristics of a metrics program: consistent (does the company use common CX metrics across the organization? ), impactful (do the CX metrics inform important decisions? ), integrated (are trade-offs made between CX and financial metrics? ), and continuous (do leaders regularly examine the CX metrics?). Only 11% of respondents received at least a “good” overall rating in this assessment, and companies earned the lowest average rating in integrated. Companies with stronger CX metrics programs deliver better customer experience and use more effort and likelihood-to-repurchase metrics. See the State of CX Metrics studies from 2011, 2012, 2013, 2014, and 2015. In the NY Times article Pollsters Face Hurdles in Changing Landscape, Ryan Knutson and Aaron Zitner discuss a number of reasons for recent high-profile polling failures, the Brexit vote and the U.S. presidential election. The outcome also raises questions about the research businesses rely on to test new products and measure customer behaviors, since many of the same survey methods are used for market research. People are less likely to answer surveys, so it’s harder to get representative samples. It’s more difficult and expensive to reach people via cell phones than it was by landline. Decision factors are changing. For instance, education level was a more important decision driver in this election than it was in 2012. The people who choose to respond to polls don’t fully represent the population. Embrace outliers. The traditional approach for dealing with data points that don’t fit a model is to ignore them or discount them as being “outliers.” But these counter-trend pieces of data can be much more than that. They may be a window into an emerging trend or a small signal about a set of customers that your current research is missing. When you see an outlying datapoint, don’t ignore it anymore. Think about what it might be telling you, and what insights you may missing. Always ask “who are we missing?” All research processes, including surveys, are biased in many different ways (see my Latest 9 Recommendations for NPS). You can minimize and address some of the biases, but there’s always the risk that you just don’t see some of them. One of the things you can do is to proactively look for the biases. Always seek to define the populations of people that you are missing or under-representing in your research, whether it’s caused by a demographic or attitudinal blind spot. If you can’t find them, then you haven’t looked hard enough. Listen, don’t just calculate. A lot of my insights about the election came from listening to what people were saying, not from crunching datasets. As the environment around your company changes, you need to spend a lot more time with qualitative, unstructured content. Why? Because structured data collection reflects historical assumptions, and may very well be missing the key variables required to fully understand changing customer attitudes and behaviors. Over-emphasize recency. If you’re building a predictive model, make sure that it is very sensitive to recent data. If you’re mapping out a long-term trend or trying to fit the data to a historical model, it may take a while for you to identify a substantive change in the environment. Even if you don’t change your core model, look at what it says if you significantly over-weight recent data points. Modernize your leadership. The way that organizations can and should use data is one of the shifts that is making traditional management techniques obsolete. That’s why you should adopt what I call Modernize Leadership: Shifting 8 Outdated Management Practices. This requires making a shift to Engage & Empower, Learn & Adjust, Detect & Disseminate, Observe & Improve, Purpose & Values, Strengths & Appreciation, Culture & Behaviors, and Experience & Emotions. The bottom line: It’s hard to project from the past when the future is changing. As many large companies use Net Promoter® Score (NPS) to evaluate their customer loyalty, Temkin Group measured the NPS of 315 companies across 20 industries. With an NPS of 68, USAA’s insurance business earned the highest score in the study for the fourth year in a row. Four other companies also earned an NPS of 60 or higher: Cadillac, USAA’s banking business, Apple, and USAA’s credit card business. In addition to earning some of the top scores, USAA’s banking, credit card, and insurance businesses also all outpaced their respective industries’ averages by more than any other company. Comcast, meanwhile, earned the lowest NPS for the second year in a row, coming in just below Time Warner Cable, Cox Communications, and McDonalds. And while all 20 industries increased their average NPS from last year, utilities enjoyed the biggest improvement in its score. Out of all the companies, US Airways’s and Advantage Rent-A-Car’s scores improved the most, whereas TriCare’s and Lexus’s scores declined the most. On average across the industries, the youngest consumers gave companies the lowest NPS, while 35- to 44-year-olds gave them the highest NPS. See the NPS Benchmark Studies from 2012, 2013, 2014, and 2015. Here’s a list of companies included in this study (.pdf). Five industries toped the list with an average NPS of 40 or more: auto dealers, software, investments, computers & tablets, and appliances. The bottom scoring industries are TV service providers, Internet service providers, and health plans. USAA’s insurance, banking, and credit card businesses earned NPS levels that are 30 or more points above their industry averages. Five other firms are 20 or more points above their peers: com, credit unions, Chick-fil-A, Apple, and Trader Joe’s. Five companies fell 25 or more points below their industry averages: RadioShack, Motel 6, eMachines, McDonalds, and Days Inn. US Airway’s NPS increased by 31 points between 2015 and 2016, the largest increase of any company. Eight other companies improved by 25 or more points: Fifth Third, 21st Century, Fujitsu, DHL, MetLife, HSBC, Commonwealth Edison, PSE&G, and Hannaford. TriCare, Lexus, Mercedes-Benz, Baskin Robins, and Nordstrom had double-digit declines in NPS between 2015 and 2016. If you want to know what data is included in this report and dataset, download this sample Excel dataset file. P.S. Net Promoter Score, Net Promoter, and NPS are registered trademarks of Bain & Company, Satmetrix Systems, and Fred Reichheld. Companies that have voice of the customer (VoC) programs (including NPS) often put in place a closed-loop process. Those efforts often focus on closing a single loop, immediately responding to a customer after they respond to a survey. But this represents only one of four loops that companies need to close. In the report, Make Your VoC Action-Oriented, we introduced the concept of four closed loops. Immediate Response. Reach out to a restaurant customer who responded on a survey that the bathroom was dirty and help take care of her ongoing concerns. Corrective Action. Get the manager or employee to clean the bathroom in that restaurant. Continuous Improvement. Create new process for restaurants to check and clean bathrooms on a regular basis. Strategic Change. As part of new restaurant formats, design bathrooms so that they don’t require as much time from employees to keep them clean. The bottom line: Make sure to build out four closed loops. We just published a Temkin Group report, What Happens After a Good or Bad Experience, 2016. This is our annual analysis of which companies deliver the most and least bad experiences, how consumers respond after those experience (in terms of sharing those experiences and changing their purchase behaviors), and the effect of service recovery (see last year’s report). We asked 10,000 U.S. consumers about their recent interactions with 315 companies across 20 industries, and compared results with similar studies over the previous five years. More than 20% of the customers of Internet service providers and TV service providers reported a bad experience, considerably above the rates for any other industry. Air Tran Airways, Time Warner Cable (TV service and Internet service), Comcast (TV service), and HSBC delivered bad experience to at least one-quarter of their customers. At the same time, less than 3% of Michael’s, Advance Auto Parts, Whole Foods, Publix, Subway, Vanguard, Trader Joe’s, and GameStop customers report having bad experiences. We examined the combination of the volume of bad experiences and the resulting revenue impact and created a Revenues at Risk Index for all 20 industries. At the top of the list, TV service providers and rental car agencies stand to lose at least 6.5% of their revenue from bad experiences. Conversely, less than 2% of the revenues for retailers and supermarket chains are at risk. The companies that recovered very poorly after a bad experience lost sales from 63% of their customers, more than 2.5 times as many as companies that recovered very well. Companies that do a very good job at recovering after a bad experience have more customers who increase spending than those who decrease spending. After a very bad or very good experience, consumers are more likely to give feedback directly to the company than they are to post on Facebook, Twitter, or third party rating sites. Regardless of the channel, consumers are more likely to discuss a very bad experience than a very good one. While the way that consumers give feedback has not changed much since last year, the volume of Twitter usage grew for both positive and negative experiences. Piggly Wiggly, US Cellular, Fifth Third, The Hartford, TriCare, and PSE&G face the potential for the most negatively biased feedback from customers. We just published a Temkin Group data snapshot, Media Use Benchmark, 2016. This is our annual analysis of how much time consumers spend using different media channels (see last year’s data snapshot). In January 2016, we surveyed 10,000 U.S. consumers about their media usage patterns and compared the results to similar data we collected in January 2015, January 2014, January 2013, and January 2012. Our analysis examines the amount of time consumers spend every day watching television, browsing the Internet (for both work and leisure), reading books (both print and electronic), reading newspapers (both print and electronic), listening to the radio, reading a print magazine, and using a mobile phone. This data snapshot breaks down the results by income level, education level, and, most expansively, by age. Time spent with mobile web/apps has increased the most, followed by using the Internet at work and at home. Time spent with TV, radios, books, and newspapers have declined. We just published a Temkin Group report, Lessons in CX Excellence, 2016. The report provides insights from eight finalists in the Temkin Group’s 2015 CX Excellence Awards. The report, which is 100 pages long, includes an appendix with the finalists’ nomination forms. This report has rich insights about both B2B and B2C customer experience. This year, we chose eight organizations as finalists for Temkin Group’s 2015 Customer Experience Excellence Award. The finalists for 2015 are EMC Global Services, Hagerty, InMoment, Safelite AutoGlass, SunPower, The Results Companies, Verint, and Wheaton | Bekins. This report provides specific examples describing how these companies’ CX efforts have created value for both their customers and for their businesses. We also highlight best practices across the four customer experience competencies—purposeful leadership, compelling brand values, employee engagement, and customer connectedness. We have included all of the finalists’ detailed nomination forms at the end of this report to help you compile examples and ideas to apply to your own CX efforts.